Though the Solemnity of Sunday supercedes the celebration of the Memorial of St. Serapion, it is, nevertheless, a good moment to recall his life, as a great gift to the Church and to the Order of Mercy.... His Feast is November 14. Irish by birth, Serapion was born around 1179. He enlisted as a soldier in the army of his king, Richard the Lion-Hearted, and later in the company of the Duke of Austria, Leopold VI the Glorious, he enlisted in his squadron to go to Spain to help the Christian army of Alfonso VIII who was fighting Moslems. Once he was in Spain, Serapion decided to stay in the service of the king of Castile to continue fighting to defend the Catholic faith. There, he had the opportunity to meet Peter Nolasco and his brothers who dedicated themselves to the defense of the same faith except that they were not fighting against the Moors. Instead, they were freeing Christian captives from the power of the Moors and they pledged their own lives in this endeavor. In 1222, Serapion requested and received the Mercedarian habit. He carried out several redemptions. 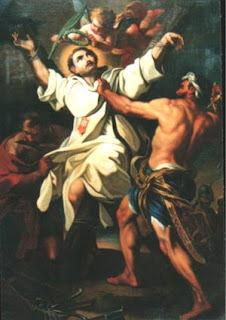 In the last one which he carried out with his redeeming companion Berenguer de Bañeres, Serapion had to remain as a hostage for some captives in danger of renouncing their faith. The other redeemer traveled quickly to Barcelona to look for the ransom money. Peter Nolasco, who was in Montpellier at the time, wrote an urgent letter to his lieutenant Guillermo de Bas asking him to notify all the monasteries to collect alms and to send them immediately to Algiers. But the money for the ransom did not arrive at the stipulated time and the disappointed Moors inflicted an atrocious death on Serapion. They nailed him on an X-shaped cross, like Saint Andrew’s cross and they savagely dismembered him. The barbarian and cruel King of Algiers, Selín Benimarin, was the one who gave the Church and the Mercedarian Order this saintly martyr on November 14, 1240.